The original organ of King’s College was thought to be built in around 1854, and was housed in the old chapel; there is very little information existing of this organ, although it seems to have formed the basis of the 1866 instrument which was built in the new chapel designed by Sir George Gilbert Scott, who also designed the new organ façade which exists today. The organ remained pretty much undisturbed until 1932, when the roof of the chapel was dramatically lowered to facilitate the building of a new Anatomy department directly on top of the chapel. Willis III completely rebuilt and electrified the organ, which had to be lowered about 3 metres to avoid the newly lowered ceiling, a detached console was provided and sited on the chapel floor. This instrument lasted until 1977 when the Bishop company were brought in to radically alter the organ once again. Tonally the organ was introduced to more neoclassical voices, and some of the Willis I & III pipework was lost. Direct pallet soundboards were introduced with mixed results. A new console was supplied by Bishop’s in 2000. We were called in by the College’s new advisor, David Titterington to see what could be done with the organ, which by 2016 was not in a good working order and was felt not to be a suitable instrument for such a world class university chapel and its choir. 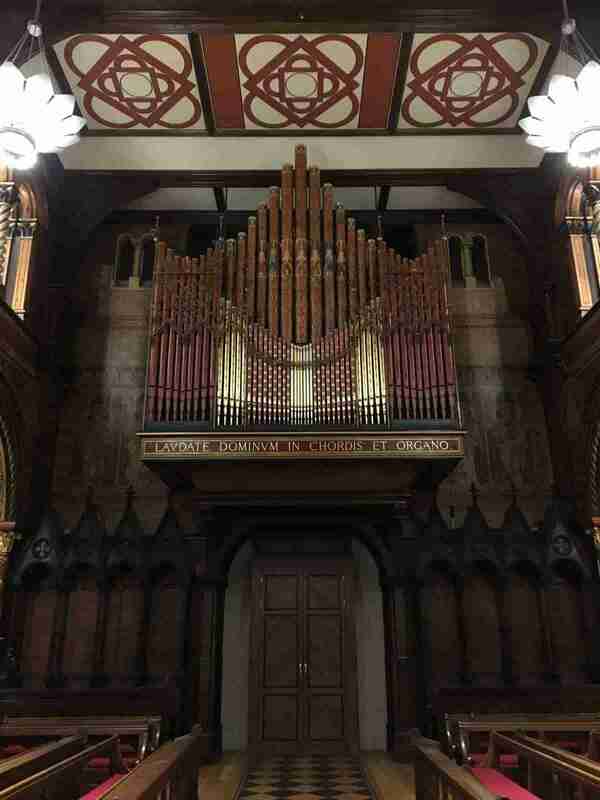 We recommended the thorough rebuilding of the organ with a completely new mechanism using the best of the remaining Willis pipework, including the superb façade. The new organ would not be a Willis reconstruction, but tonally would be very much influenced by Father Willis. A new Great chorus was made, as the old chorus had been much altered and revoiced, and was no longer thought to be up to the job of supporting the organ as the foundation of the new instrument. The former Great Principal went on to the Choir, and the Fifteenth and tierce Mixture went on to the Swell. The old Great Open Diapason became the new Pedal Principal. The superb Willis reeds had all survived pretty much unscathed and were kept, a new Vox Humana (copied from the Union Chapel, Islington) was re-introduced to the Swell as were new Pedal reeds, all made to Fr Willis scales. A new Flûte à Cheminée was also made for the Swell, this time copied from the Royal Albert Hall. Barring the larger bass notes, all the pipework is now on slider soundboards; there are no borrowings or extensions. The organ has also been provided with an exquisite new console and mobile platform, all made in solid European oak. The stencilling and painting of the façade were restored by Robert Woodland. Scales for the King's College Chapel Organ. The opening recital by David Titterington, and blessing of the organ by the Dean took place on the 12th November 2018.